This is a series of conferences held at Dore Gallery, Bond Street, London in 1909. Self-help subjects such as the creative power of thought and affirmations, mixed with some Christian teachings. The addresses contained in this volume were delivered by me at the Dore Gallery, Bond Street, London, on the Sundays ofthe first three months of the present year, and are now published at the kind request of many of my hearers, hence their title of “The Dore Lectures.” A number of separate discourses on a variety of subjects necessarily labours under the disadvantage of want of continuity, and also under that of a liability to the frequent repetition of similar ideas and expressions, and the reader will, I trust, pardon these defects as inherent in the circumstances of the work. 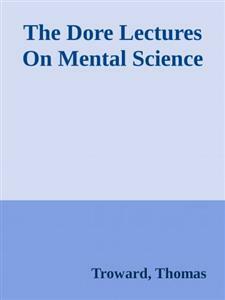 At the sametime,it will be found that, although not specially so designed, there is a certain progressive development of thought through the dozen lectures which compose this volume, the reason for which is that they all aim at expressing the same fundamental idea, namely that, though the laws of the universe can never be broken, they can be made to work under special conditions which will produce results that could not be produced under the conditions spontaneously provided by nature. This is a simple scientific principle and it shows us the placewhich is occupied by the personal factor, that, namely, of an intelligence which sees beyond the present limited manifestation of the Law into its real essence, and which thus constitutes the instrumentality by which the infinite possibilities of the Lawcan be evoked into forms of power, usefulness, and beauty. The more perfect, therefore, the working of the personal factor, the greater will be the results developed from the Universal Law; and hence our lines of study should be two-fold, on the one hand the theoretical study of the action of Universal Law, and on the other the practical fitting of ourselves to make use of it; and if the present volume should assist any reader in this two-fold quest, it will have answered its purpose. The different subjectshave necessarily been treated very briefly, and the addresses can only be considered as suggestions for lines of thought which the reader will be able to work out for himself, and he must therefore not expect that careful elaboration of detail which I would gladly have bestowed had I been writing on one of these subjects exclusively. This little book must be taken only for what it is, the record of somewhat fragmentary talks with a very indulgent audience, to whom I gratefully dedicate the volume. We all know the meaning of this phrase in our everyday life. The Spirit is that which gives life and movement to anything, in fact it is that which causes it to exist at all. The thought of the author, theimpression of the painter, the feeling of the musician, is that without which their works could never have come into being, and so it is only as we enter into the IDEA which gives rise to the work, that we can derive all the enjoyment and benefit from it which it is able to bestow. If we cannot enter into the Spirit of it, the book, the picture, the music, are meaningless to us: to appreciate them we must share the mental attitude of their creator. This is a universal principle; if we do not enter into theSpirit of a thing, it is dead so far as we are concerned; but if we do enter into it we reproduce in ourselves the same quality of life which called that thing into existence. Now if this is a general principle, why can we not carry it to a higher range ofthings? Why not to the highest point of all? May we not enter into the originating Spirit of Life itself, and so reproduce it in ourselves as a perennial spring of livingness? This, surely, is a question worthy of our careful consideration. The spirit ofa thing is that which is the source of its inherent movement, and therefore the question before us is, what is the nature of the primal moving power, which is at the back of the endless array of life which we see around us, our own life included? Science gives us ample ground for saying that it is not material, for science has now, at least theoretically, reduced all material things to a primary ether, universally distributed, whose innumerable particles are in absolute equilibrium; whence it follows on mathematical grounds alone that the initial movement which began to concentrate the world and all material substances out of the particles of the dispersed ether, could not have originated in the particles themselves. Thus by a necessary deduction from the conclusions of physical science, we are compelled to realize the presence of some immaterial power capable of separating off certain specific areas for the display of cosmic activity, and then building up a material universe with all its inhabitants by an orderly sequence of evolution, in which each stage lays the foundation for the development of the stage, which is to follow,in a word we find ourselves brought face to face with a power which exhibits on a stupendous scale, the faculties of selection and adaptation of means to ends, and thus distributes energy and life in accordance with a recognizable scheme of cosmic progression. It is therefore not only Life, but also Intelligence, and Life guided by Intelligence becomes Volition. It is this primary originating power which we mean when we speak of“The Spirit,”and it is into this Spirit of the whole universe that we must enter if we would reproduce it as a spring of Original Life in ourselves. Now in the case of the productions of artistic genius we know that we must enter into the movement of the creative mind of the artist, before we can realize the principle which gives rise to his work. We must learn to partake of the feeling, to find expression for which is the motive of his creative activity. May we not apply the same principle to the Greater Creative Mind with which we are seeking to deal? There is something in the work of the artist which is akin to that of original creation. His work, literary, musical, or graphic is original creation on a miniaturescale, and in this it differs from that of the engineer, which is constructive, or that of the scientist which is analytical; for the artist in a sense creates something out of nothing, and therefore starts from the stand-point of simple feeling, and notfrom that of a pre-existing necessity. This, by the hypothesis of the case, is true also of the Parent Mind, for at the stage where the initial movement of creation takes place, there are no existing conditions to compel action in one direction more than another.Consequently,the direction taken by the creative impulse is not dictated by outward circumstances, and the primary movement must therefore be entirely due to the action of the Original Mind upon itself; it is the reaching out of this Mind for realization of all that it feels itself to be. The creative process thus in the first instance is purely a matter of feeling,exactly what we speak of as“motif”in a work of art. Now it is this original feeling that we need to enter into, because it is the fonset origo of the whole chain of causation which subsequently follows. What then can this original feeling of the Spirit be? Since the Spirit is Life-in-itself, its feeling can only be for the fuller expression of Life,any other sort of feeling would be self-destructive and is therefore inconceivable. Then the full expression of Life implies Happiness, and Happiness implies Harmony, and Harmony implies Order, and Order implies Proportion, and Proportion implies Beauty; so that in recognizing the inherent tendency of the Spirit towards the production of Life, we can recognise a similar inherent tendency to the production of these other qualities also; and since the desire to bestow the greater fulness of joyous life can only be described as Love, we can sum upthe whole of the feeling which is the original moving impulse in the Spirit as Love and Beauty,the Spirit finding expression through forms of beauty in centres of life, in harmonious reciprocal relation to itself. This is a generalized statement of the broad principle by which Spirit expands from the innermost to the outermost, in accordance with a Law of tendency inherent in itself. It sees itself, as it were, reflected in various centres of life and energy, each with its appropriate form; but in the first instance these reflections can have no existence except within the originating Mind. They have their first beginning as mental images, so that in addition to the powers of Intelligence and Selection, we must also realise that of Imagination as belongingto the Divine Mind; and we must picture these powers as working from the initial motive of Love and Beauty. The progress of shipbuilding affords a good example of what I mean. Formerly wood was employed instead of iron, because wood floats in water and iron sinks; yet now the navies of the world are built of iron; careful thought showed the law of floatation to be that anything could float which, bulk for bulk, is lighter than the mass of liquid displaced by it; and so we now make iron float by the very same law by whichit sinks, because by the introduction of the PERSONAL factor, we provide conditions which do not occur spontaneously,according to the esoteric maxim that“Nature unaided fails.”Now we want to apply the same process of specializing a generic Law to the first of all Laws, that of the generic life-giving tendency of Spirit itself. Without the element of INDIVIDUALPERSONALITY,the Spirit can only work cosmically by a GENERIC Law; but this law admits of far higher specialization, and this specialization can only be attained through the introduction of the personalfactor. But to introduce this factor the individual must be fully aware of the PRINCIPLE which underlies the spontaneous or cosmic action of the law. Where, then, will he find this principle of Life?Certainly not by contemplating Death. In order to get a principle to work in the way we require it to, we must observe its action when it is working spontaneously in this particular direction. We must ask why it goes in the right direction as far as it does,and having learnt this we shall then be able to make it go further. The law of floatation was not discovered by contemplating the sinking of things, but by contemplating the floating of things which floated naturally, and then intelligently asking why they did so. Now Death is the absence of Life, and diseaseis the absence of health, so to enter into the Spirit of Life we require to contemplate it, where it is to be found, and not where it is not- -we are met with the old question,“Why seek ye the living among the dead?”This is why we start our studies by considering the cosmic creation, for it is there that we find the Life Spirit working through untold ages, not merely as deathless energy, but with a perpetual advance into higher degrees of Life. If we could only so enter into the Spirit as to make it personally IN OURSELVES what it evidently is in ITSELF, the magnum opus would be accomplished. This means realizing our life as drawn direct from the Originating Spirit; and if we now understand that the Thought or Imagination of the Spirit is the great reality of Being, and that all material facts are only correspondences, then it logically follows that what we have to do is to maintain our individual place in the Thought of the Parent Mind. He then finds himself to be as the Bible says,“the image and likeness of God.”He has reached the level at which he affords a new starting point for the creative process, and the Spirit, finding a personalcentre in him, begins its work de nova, having thus solved the great problem of how to enable the Universal to act directly upon the plane of the Particular. It is in this sense, as affording the requisite centre for a new departure of the creative Spirit,that man is said to be a“microcosm,”or universe in miniature; and this is also what is meant by the esoteric doctrine of the Octave, of which I may be able to speak more fully on some other occasion.